Rosalyn has blended the warmth of wood and the love of nature’s wildlife into unique creations exemplifying free-flowing motion and spirit! 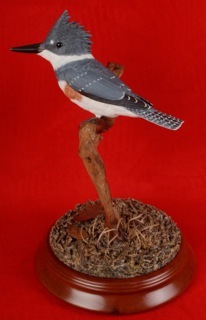 Her works center around birds and animals found throughout nature. Though educated as a registered nurse, Rosalyn has advanced her love of wildlife and nature into professional woodcarving. Recognition of her talents has been acknowledged by her requested participation in many prestigious shows and exhibits. She has exhibited at the Easton Waterfowl Festival since 1981. She has also exhibited at The Southeastern Wildlife Expo, Annapolis Fine Arts Festival, Wings and Water Festival, and many others. In addition, the State of Delaware has purchased her work for its art loan collection. 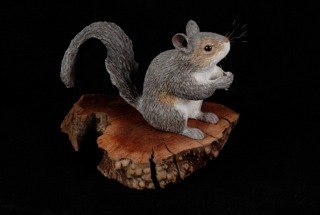 Having a life-like quality, Rosalyn’s carvings are prized additions to collections around the world. Her sense of wonder and her awareness of nature’s elegance radiate from the bird and animal carvings she creates. Viewing her creations gives one a sense of joy about the boundless beauty of nature and its wildlife creatures and habitats. In addition to selling her creations, Rosalyn does accept commissions on a species that inspires and intrigues her. Rosalyn has continued to grow in her own art and share her techniques and insights with many others through teaching seminars and writing books. 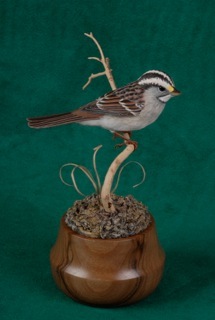 Her books include Songbird Carving, Songbird Carving II, Shorebird Carving, Upland Game Bird Carving, and Baby Bird and Chick Carving. Each book is a teaching text instructing the carver step-by-step from block of wood to completed bird carving. Because of her many years of teaching bird and animal carving, Rosalyn knows the problem areas of her students’ carvings and addresses those needs with her drawings, photographs, and text. She shares her experiences and love of wildlife with family, friends and students in her home based studio in Newark, Delaware as well as seminars across the country.